(accessible with a Daft Club card given with first press of Discovery album). Alive 1997 was divided in 3 bits (called Daftendirektour part1/2/3). resurfaced as the compilation album Daft Club. Great Reissue, Nice warm bass sounds. Can't compare to the original but sounds fantastic, Worth a Grab. 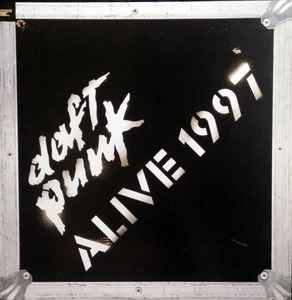 Alive 1997 is an excerpt taken from their full set during the Daftendirektour at the Burmingham Que club. It's A shame we probably wont ever get to hear the full set, but what we got is amazing! Alive 1997 is definitely one of their best works. It is an amazing listen to, and the set still holds up to live sets of today's DJ's. Does this come with stickers? The vinyl is getting a repress, along with Alive 2007!!! I echo the thoughts of the previous reviewer. This isn't really mainstream house, it's heavily remixed, heavily manipulated, and at times its just raw beats and basslines. A very underground sound to the CD overall. There are releases like this one that get too experimental, too self-absorbed, too obnoxious and cheeky, and when that happens, it turns into utter crap. But Daft Punk manage to control themselves, they do not go overboard with the complexity, and they keep a good amount of melody in there. Moreover, 45 minutes is the ideal length for a CD such as this one. Any shorter, and its not really a complete mix, and any longer, and it will probably become an annoying headache - I don't necessarily mean that in a bad way, but that's just the nature of the type of music being spun - it's on the harder side of house music. I'd say this is worth 5 stars because of the technical prowess that went into mixing this. Alive 1997 has the distinct pleasure of being from a fairly mainstream group but having an almost bootleg-like underground sound to it.